Candied citrus has never been top of my list of things to make. Maybe it’s being a summer-born baby, but I’ve always been drawn to fresh and ripe over fruit which has been candied, preserved or stewed. I even, shamefully, used to pick the pieces of peel from hot cross buns: it just didn’t do anything for me. 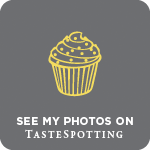 Until, that is, I visited Skye Gyngell’s new restaurant Spring and tried her candied blood orange and cardamom ice cream. The ice cream in question came as part of a trio of frozen treats from the Salon at Spring. After two hearty courses plus generous (greedy) rounds of their delicious sourdough bread and butter sprinkled with sea salt, ice cream felt like the lighter option for pudding. Lemon bergamot and hazelnut stracciatella were divine – I’ve earmarked both as recipes to try soon – but the understated elegance of the blood orange and cardamom is what really stayed with me. There were slivers of candied peel, cut fine so that they almost melted into the milky ice cream, a delicate orange flavour and the subtle scent of cardamom. Something I’d never normally order, but which I knew I needed to recreate. The Spring cookbook publishes in May this year and on the basis of that one meal alone I’ve pre-ordered. I love Skye Gyngell’s recipes anyway and her simple, seasonal approach to cooking is one that has influenced my own (both savoury and sweet) no end. I’m hoping that the recipe for that candied blood orange and cardamom ice cream is in there, but until then I’ve had fun experimenting with this version of my own. I filled a bag with blood oranges at the market, trying to pick ones with the most blush in their skins. Blood oranges are always a slight Russian roulette and while the first two I sliced open for breakfast were deeply purple, the ones you see in these pictures are a little more understated. 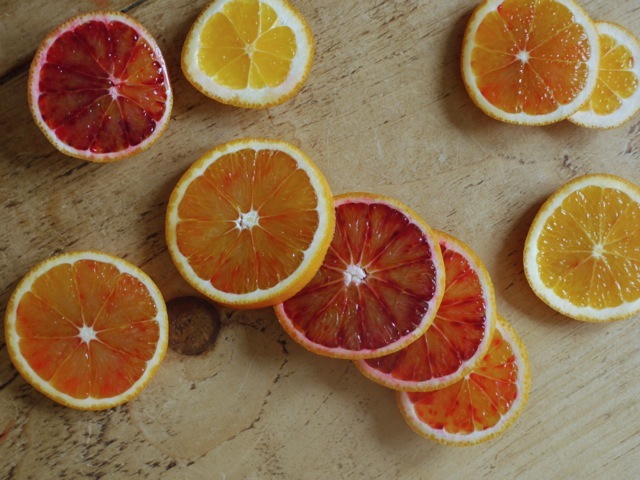 To be honest, I think regular oranges would work just as well – I went for blood orange because that’s what Skye’s menu referenced, but if you don’t have access to them a navel orange or similar should be fine. Which is good news if you’re reading this post even a week after it publishes as blood orange season is so tantalisingly short. I’ve been eating this ice cream as it is but it’s also calling ‘chocolate’ to me: next time I might add some chunks. Drenching the whole lot in chocolate sauce would probably be overkill, but for a fancy dinner party dessert I’d love to try scoops dipped in a dark chocolate shell (in the style of these tartufi) for a chocolate orange of sorts. 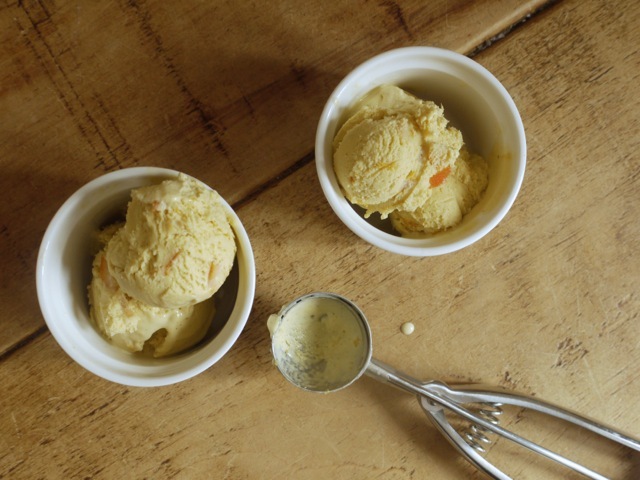 A sweet, spiced ice cream with zingy slices of candied orange peel. The cardamom works beautifully with the orange but has the potential to overpower: one and a half teaspoons might sound finickity but I find one doesn't deliver quite enough flavour and two is a little too much. Start by making the candied blood orange. In a wide saucepan, combine the sugar with 250ml water and heat until the sugar has dissolved. Bring to the boil then add the orange slices in a single layer over the bottom of the pan. Reduce the heat and simmer, turning the orange slices occasionally, for 20 minutes or until the orange pith is translucent. 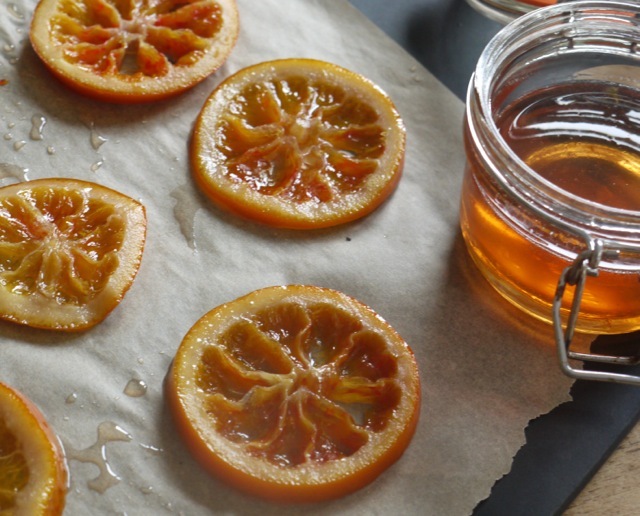 Transfer the slices to a piece of baking parchment to dry out, reserving the sticky orange syrup. To make the ice cream, combine the milk, cream, cardamom and vanilla pods and seeds in a medium saucepan. Bring just to the boil, turn of the heat then cover with a lid and leave to infuse for one hour. Meanwhile, in a medium bowl, whisk together the egg yolks, sugar and salt. Strain the milk mixture through a fine mesh sieve to remove the cardamom and vanilla pods then return to the saucepan. Heat until simmering then pour the warm milk mixture over the egg yolks, whisking constantly until combined. Return this mixture to your saucepan and cook over a low heat, stirring pretty much continuously, until thickened to a custard consistency: it should coat the back of your spoon. 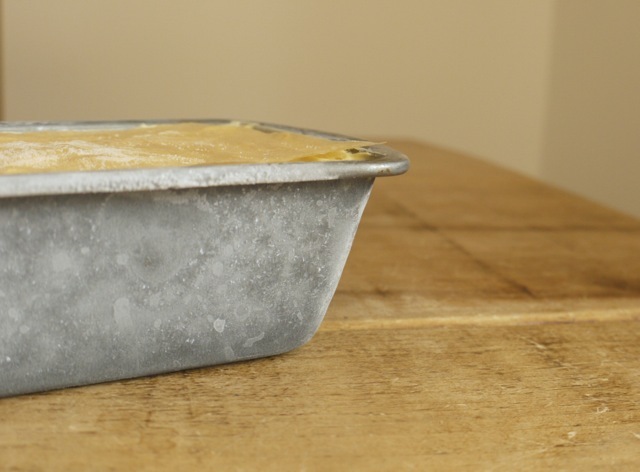 Remove from the heat and strain through a fine mesh sieve into a container that will fit in your fridge. Allow to cool at room temperature then refrigerate for a minimum of 5 hours. Cut the candied orange into thin slices. Whisk the reserved orange syrup into your chilled custard then churn in an ice cream machine according to your manufacturer's instructions. 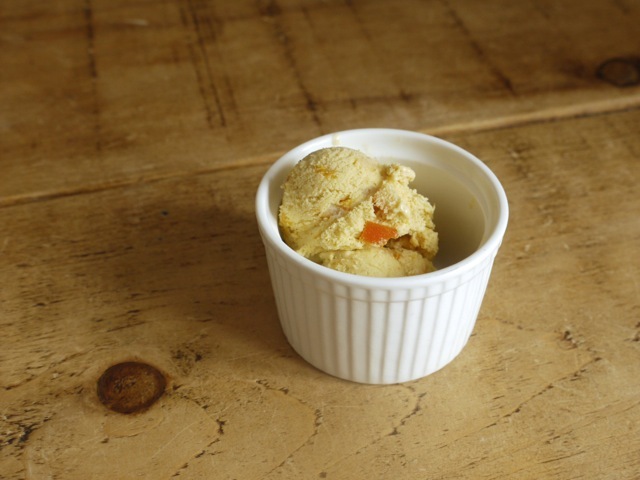 Transfer the ice cream to a container and fold through the candied orange slices. Smooth the top flat and freeze until ready to eat, taking the ice cream out of the freezer 5 - 10 minutes before serving to allow it to soften. This recipe is inspired by a dessert I ate at Skye Gyngell's restaurant Spring. I make a lot of homemade ice cream and love experimenting with different flavour combinations. This one sounds great. Thanks for the tip. I look forward to trying it out soon. This sounds so lovely! The combination of bright + sweet citrus with the fragrant warmth of cardamom is perfect. This sounds delicious and the pictures are beautiful. 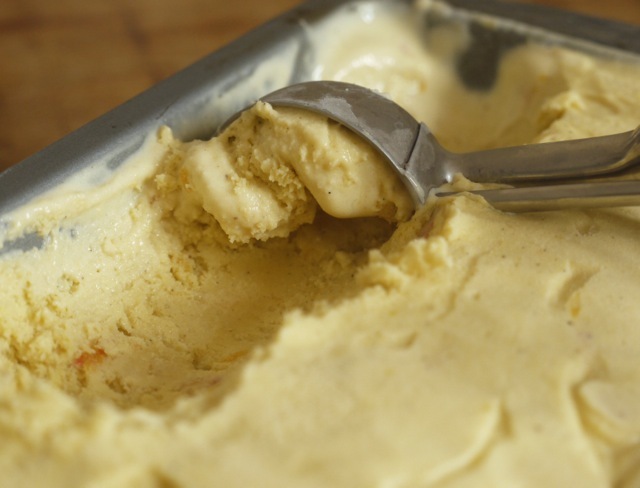 I love the combination of orange and cardamom, thank you for sharing this great recipe! I love the flavours of this, it sounds absolutely gorgeous. Also, I used to hate any kind of candied fruit or candied orange peel until I started making my own – only then did I realise what wonderful flavour candying can bring out. I bet the little nuggets of candied blood orange work beautifully here. You have to go, the food is so good (not cheap, but so delicious). I’ve not heard of Rochelle Canteen, will have to give it a try! It is funny how candied citrus (also the fruit and choc combination) is something that has been growing on me over the years: I always depsised it and picked out the pieces like you did and lately I have actually started to really enjoy it. I think it is something you appreciate as you get older. This sounds delicious. Gorgeous! My ice cream maker is one of the things I miss the most. We had to leave it (and all other electronics) behind when we moved overseas, and it’s the only thing I’ve yet to replace. Our little Euro freezer just isn’t big enough to freeze the canister! One day, though, and this is bookmarked for then. The flavors in this are calling to me! This sounds incredible, and I love the precision of that 1 1/2 tsp 🙂 You’re so right, it’s amazing how easily cardamom can either overpower or make you want just a smidge more. Love this so much!